this was my favorite brewery experience in texas, even including jester king i think. its off the radar somehow still, but the space, the people, and the beers are all beyond first rate, we had an absolute ball here. 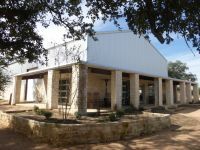 its got the same outdoorsy hill country vibe as some others in the region, a new and clean looking brewery and taproom space, this one with a nice wrap around porch with some rocking chair type seating, and then tables on the ground under shade trees or around fire places. its a family business, with a religious to a lot of the beers and names and art and such, everyone on hand when we were there was amazingly kind. they offered to build us a fire because it was chilly, they told us long stories about the brewery and the beers, and they were shockingly humble. the space was great, but its the beers that set it apart. they had a little bit of everything from hazy hops to barrel aged fruited wild beers, and all of it was excellent, but it was a couple of unique ones that endeared me the most. they had a brown ale made with a grandmothers recipe nut roll actually in the beer, it was insanely different and delicious, like nothing we had ever tasted before. wild beers were all fantastic too, everything just so thoughtful and high quality. they have some outdoor games to place, a rad pizza oven in front when we were there, and it looks like a good spot for some live music in the summer too. i was blown away by this place, do not miss it if you are anywhere near here, it was the highlight of our trip for me. cant say enough about the people, the vibe, and the beer!